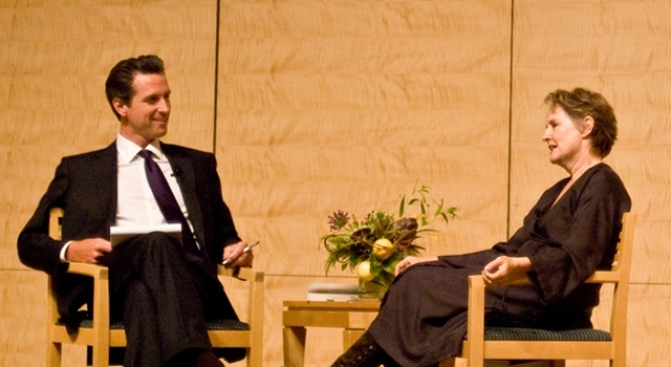 Mayor Gavin Newsom speaks with Alice Waters. You may have thought that the Obama Garden was move in the right direction for America, but a segment on last night's Daily Show reveals that some think people like Berkeley's Ann Cooper (who makes a cameo) and Alice Waters are dead wrong. Says one wacko: "It's irresponsible to tell people to only eat organic and locally grown food...People are going to eat fewer fruits and vegetables. Cancer rates will go up. Obesity rate will go up...we're going to have a lot of starvation." The more responsible solution, of course, is to urge America to be more efficient and use pesticides.